One of the most diverse places to live is a huge metropolitan area like Washington D.C. All walks of life can be seen, from the richest of the wealthy, to the disenfranchised of the poor. One downside to living in a metropolitan area, however, is the increased cost of living. So it is no surprise that some of the largest cities in the country also house the highest poverty rates: with cities like Boston, Baltimore, Philadelphia, and Indianapolis topping the list. The inequality gaps start from paid income. An extremely small percentage of the population earn an income of above $150,000, while the overwhelming majority having a salary of less than $45,000. According to the most recent census released by the United States Census Bureau, the rate of poverty in the U.S. has climbed to its highest level in more than 20 years, with a rate of 15.1 percent. This means that approximately 46 million people in the U.S. are living at or below the poverty line, also making it the largest number since the bureau started tracking poverty in 1959. One of the contributing factors to the increases in poverty is the stark racial divide in the area. Racial segregation in large urban areas usually leads to more concentrated poverty and fewer opportunities for economic mobility–which perfectly defines Washington D.C. According to Brookings, 94 percent of the D.C. neighborhoods with a majority white population have less than 10 percent of their families living below the poverty line, compared with 22 percent of majority black neighborhoods. 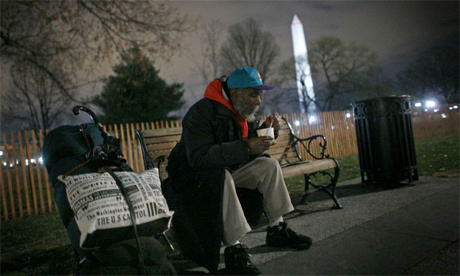 Washington D.C. has also had a huge issue with housing the homeless, particularly in the winter time. According to the Huffington Post, from February to May of 2013, a local youth shelter turned away at least 150 unaccompanied minors due to lack of emergency shelter space–many of whom also had children of their own. Since that time, the numbers have only increased. Coincidently, The Department of Human Services interprets the Homeless Services Reform Act to say that minors are not entitled to the right to shelter in freezing temperatures, and so the government has no legal obligation to create the facilities to house them. Another startling statistic from the Huffington Post states that Washington, D.C. has the nation’s second highest rate of food insecurity among children–meaning that 1 in 3 children live in households that just do not have the means to feed them sufficiently, if at all. This is truly saddening news about an issue that has seemed to ferment for years; but hopefully with the shallow economic upturn, Washington D.C. can do more to shelter the homeless, and give meaningful and consistent work to those in need.